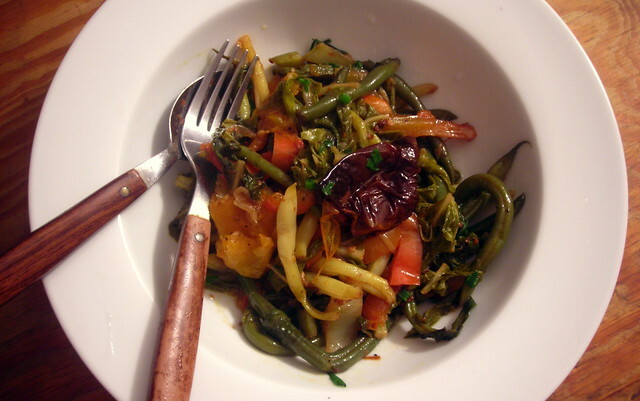 Essentially, this is an everything-but-the-kitchen sink vegetable stew. The version pictured contains: onion, celery, green beans, wax beans, heirloom tomatoes, plum tomatoes, heirloom garlic, green chard, sea salt, black pepper, peperoncini and tomato confit. Sweet potato “fingers” are underdeveloped sweet potatoes. I love carrots and sweet potatoes. I think they’re underused, underrated vegetables that don’t get their proper due. 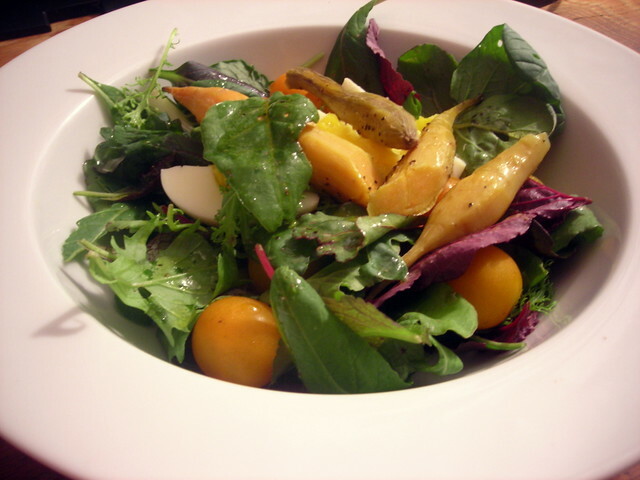 Sometimes, the best thing you can do to a vegetable is to treat it very simply. 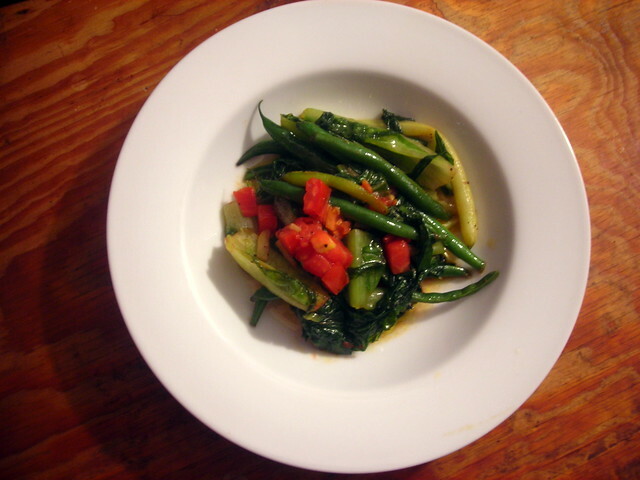 The string beans were simmered in lightly salted water, then sautéed in olive oil, with chopped garlic, escarole and chopped heirloom tomatoes. 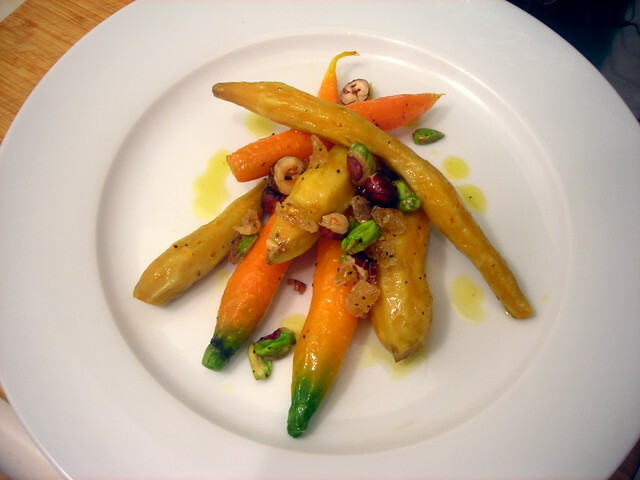 I added a bit of salt and pepper, to taste, then drizzled some extra-virgin olive oil on top. That’s it. That’s all you really need to make a bowl of vegetables sing. 24 Sep	This entry was published on September 24, 2013 at 3:14 am. It’s filed under American cuisine, autumn, cooking, food, food photography, Gluten-Free, summer, Union Square Greenmarket, vegan, vegetarian and tagged autumn, food, food photography, gluten-free, summer, Union Square Greenmarket, vegan, vegetarian. Bookmark the permalink. Follow any comments here with the RSS feed for this post.